Over the past two decades, independent director Gregg Araki has emerged as one of the most intriguing auteurs of contemporary U.S. cinema. A leading figure of the New Queer Cinema movement of the early 1990s, Araki is known for his innovative, eye-opening, and at-times-controversial films aimed primarily at queer audiences. 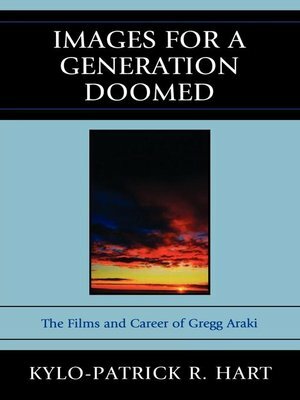 Images for a Generation Doomed: The Films and Career of Gregg Araki explores the films and career trajectory to date of this New Queer Cinema pioneer. Offering in-depth analyses of films such as The Living End, Totally F***ed Up, The Doom Generation, Nowhere, and Splendor, Kylo-Patrick R. Hart demonstrates how, over the course of the 1990s, the director's cinematic offerings became increasingly devoid of their early subversive potential. Hart goes on to argue that as the 1990s progressed, Araki's films were largely irrelevant to the cultural project of providing groundbreaking on-screen representations of non-heterosexual individuals living in the age of AIDS. However, Hart sees Mysterious Skin as evidence of Araki's successful attempt at reestablishing his cinematic and cultural relevancy in relation to the approaches and subject matter of contemporary queer cinema in the new millennium. Kylo-Patrick R. Hart is associate professor and chair of the Department of Film, Television, and Digital Media at Texas Christian University.